On a beheading of a journalist by a grisly terrrorist group, we were told that the scene was “offal — — offal — — terrible“. And that was just the really stupid ones in the last half hour! P.S. 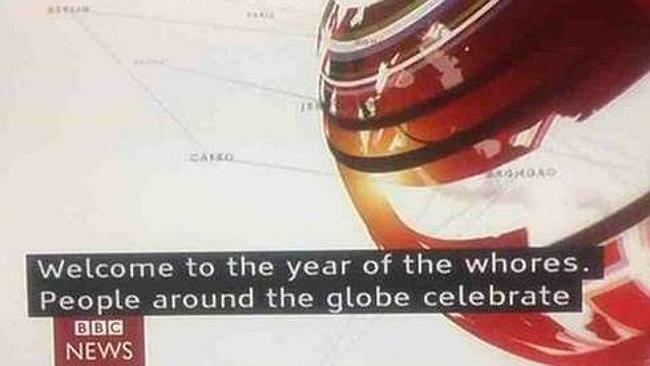 Google “bbc news subtitle fail” for t3h lolz. Also see here! I don’t normally review films that aren’t new. But I just saw a film that was so outstanding, so unbelievable, and which moved me so profoundly, I just had to share it with you. I had to share… The Secret. To coin a word, awfulsome: awesome in its awfulness. Wow. Just… wow. Incredibly bad. I mean, what the heck!? I watched this at the behest of a colleague, and, sorry — WTF????? The fact that I’ve been reduced to the untermensch language of initialisms should show that no human words can express what this “film” is. A bestial scream of agony would probably articulate it well. Firstly, how on earth did they manage to stretch literally one sentence into an entire ninety minute production???? “Whatever you think about will happen”. I kept expecting them to follow this sentence up with something, anything, but by the fifth minute I had already given up hope. Unreal how little substance there was. A 90 minute exercise in paraphrase. But people vehemently swear by The Secret, claiming it really works. Perhaps they believe this garbage because they’ve been brainwashed by hearing the same phrase, paraphrased, around six thousand times. Simple psychology; repeat the same thing over and over (and over) again, and you tend to start to believe it. Secondly, how has this become a “phenomenon”? It’s very badly made, and totally ridiculous. I mean, where do I begin? Laughable special effect “whoosh” flourishes every five seconds. Twinkly sounds, soft lighting that looks like it was added on Windows Movie Maker. Talking heads/Experts who all look beyond insane: wild stare-y eyes, incredible haircuts, ridiculous teeth, and so on. It’s like the guests are meant to be a spoof. I’m surprised they didn’t just get Armando Ianucci, Peter Serafinowicz, and that guy from Garth Merenghi to play the parts instead. And who are these guests? I mean, Google some of them and you’ll see what I mean. What. The. Eff!??! Crooks and fringe lunatics. And what is with those titles: “metaphysician”, “visionary”!?!?! WTF!!?! Sorry I keep saying that, but — WTF!? The writers are surely having us on and rolling around in laughter behind the scenes, rubbing their diamond-encrusted ring-wearing hands, and spluttering “schmucks!”. If you visualise cheques in the mail, you will literally receive cheques in the mail. No need to set up a business or get off your arse at all! But just so you don’t get carried away, the film-makers sagely advise us that we may still get the occasional bill apart from the cheques. Medicine is useless. But chanting “cancer, cancer, go away” will surely destroy all metastasized growths. I mean, sorry, The Secret was so cheap, so badly made, so idiotic, so ridiculous in every respect, the only thing this “film” deserves is the following sentence from me: whatever you do, please do NOT use “the secret” to attract free copies of “The Secret” to you…. (‘cos then they wouldn’t make money out of you) Deary me. Sadly I wasted an entire 4 minutes of my life watching this utter tripe, before my own senses started to shut themselves down. Licking wasps or poking a massive bear in the face would result in less pain than having to sit through anymore of this new age, mumbo jumbo, hippy hokum. To Netflix: Can we introduce a rating system which allows us to score garbage content lower than 1 star? We could use this waste of hard drive space as a bench mark. For example, a terrible film would awarded 3 “The Secret” Turd Piles?? So why not one star, why two? Because it was so genuinely insane in every respect that it was actually marginally entertaining. And, despite the triteness of it, there is a nice core message: positivity of mind breeds further positivity. But it’s still turd.